Without a doubt, this crustless pizza pie tastes as good as it looks. Better actually. This recipe is simple enough for my 11-year old to make by himself, and tasty enough that we all decided to add it to the menu frequently. Said 11-year old learned most of his cooking skills because we “made him” take this Kids Cook Real Food eCourse. He was hooked after the first 5-minutes of starting this class. It is fantastic!! The best part is: You can make this with any pizza toppings you like. Make it full of veggies, full of meat, or a combination of both. I will say that we made one with hamburger and one with pepperoni and all of us enjoyed the hamburger pizza pie best. The day we made these for pictures, I had no peppers or mushrooms in the house. Boo. We made them with sauce, meat, and cheese and served olives and tossed salad on the side. 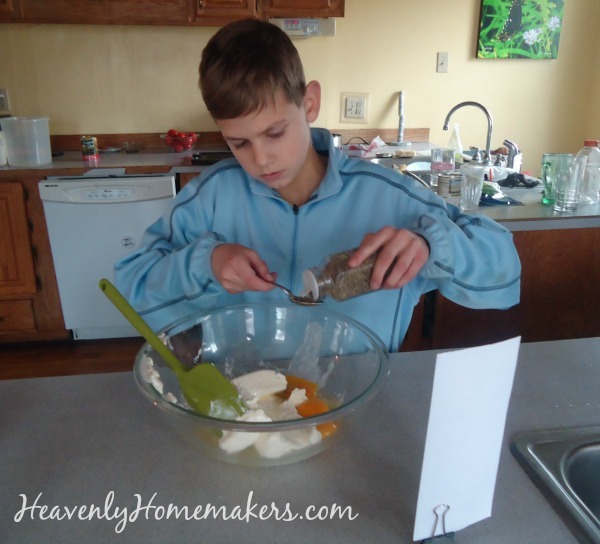 See how Malachi is using one of our DIY Recipe Card Holders to hold up his recipe? Here he is, measuring the ingredients for the Cream Cheese Layer of the Pizza Pie. 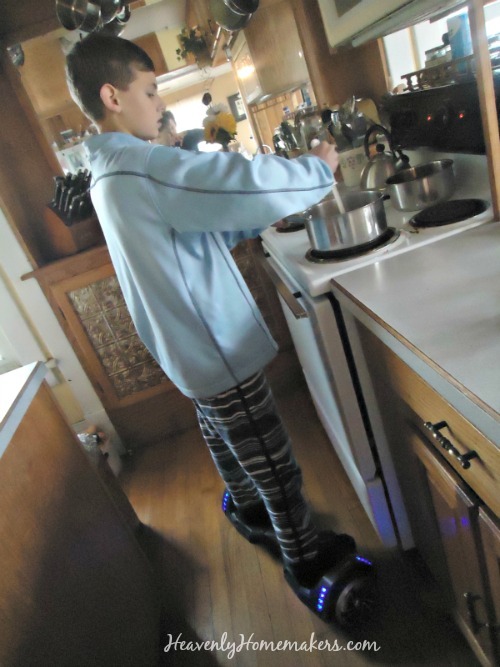 Once the Cream Cheese Layer was in the oven, Malachi browned the hamburger meat – while standing on the AlienBoard. Is there any other way to do it? I promise you will not catch me multi-tasking in this way. But yay for the 11-year old! Here is the easy-to-make, very tasty recipe for your family to enjoy. MAKE THIS WITH YOUR KIDS. But that was a given, right? In a medium-sized bowl mix cream cheese, eggs, pepper, garlic powder, and parmesan cheese until creamy. Spread mixture into a pie dish. Bake in a 350° oven for 15 minutes. In the meantime, prepare pizza toppings. Spread pizza sauce over hot cream cheese layer. Top with any meat, veggies, and cheese you like. Bake in a 350° oven for 10 minutes or until cheese has melted. Kids Cook Real Food shout out! I can’t recommend the Kids Cook Real Food eCourse highly enough. It is well worth your investment. Learn about it here. Malachi loved this class! I’m trying to figure out what the cream cheese layer is like. Any ideas on egg subs. My youngest is allergic. This looks yummy! I think you could just leave out the eggs and be fine. The eggs just help that layer hold up and be solid, but it’ll be great without too! Wow! I am amazed of the fact that you really can create a pizza without baking it. This is a fun activity for the whole family as well as you get to delight your tasteful pizza. I have a similar recipe that I make called Pizza Dip. We eat it with tortilla chips. 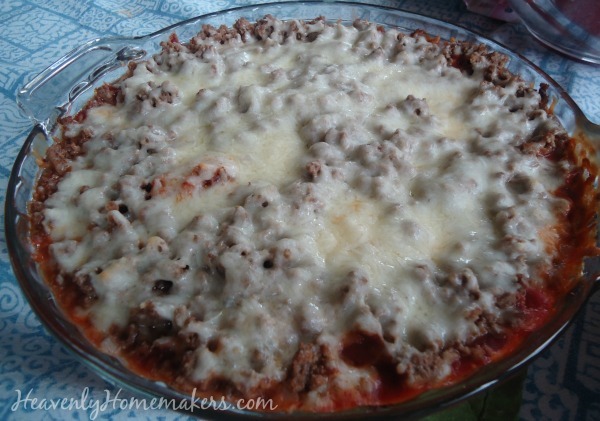 It is so yummy and you can add whatever pizza toppings you like to it! We loved it! Like the whole family! And I love that it’s lower in carbs – thank you! We had this last night and it was delicious! 4 of us licked the pie plate clean!